Machines designed to give the slabs and wall stones particular finishes. From the pitched effect to the edge finishing, they are designed in different versions: manual or automatic, according to customer needs. Ideal for recovering waste material, the Horizontal T1 is an automatic machine equipped with one splitting head that pitches sawn slabs, obtaining a split side in view face. The T1 version is suitable for those who do not need big productions, since they work the slabs on one side at a time. In the T2 version, the machine has two heads that pitch (peel) both sides of the slab obtaining in a single passage the rustic and splitted surface, so sought-after for the coverings. Thanks to the presence of two heads, the productivity of this version is very high. Machine with vertical frame of manual type that finishes the edges of blocks with surface already split and increases the rounded effect. Always working on the finishing of the edges and the rounded effect of wall stones already splitted, the PITCHING ONE is the fully automatic version in both handling and processing. 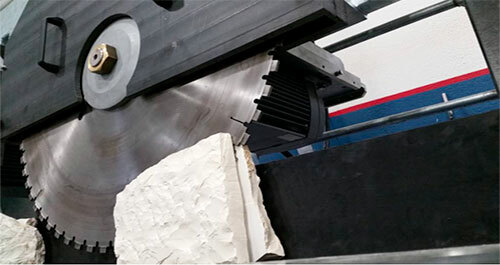 Automatic machine that transforms the sawn edges of covers and slabs giving the split face on edge. Our machines guarantee precision and efficiency for every kind of processing. Stone splitting, stone cutting, concrete cutting. For each kind of processing Mec ensures you maximum precision even in the details. We build customized machines, ensuring a 360 ° personalization. The customer’s requirements and the finish product are the start and finish checkpoints of our design and production. Our machines guarantee absolute power for every kind of processing. The power of each machine comes with high precision that streams with no precedents. This means quality, this means why choosing Mec.